Villa Hanani boasts 4 units of 3 bedroom villa. Each villa has 3 fully furnished appointed bedrooms with king size double beds at the 1st and 2nd bedroom, and two single size beds at the 3rd bedroom. Every villa features a 400 sqm Balinese style pavilions furnished with a large lush tropical garden and a spacious lotus pond. 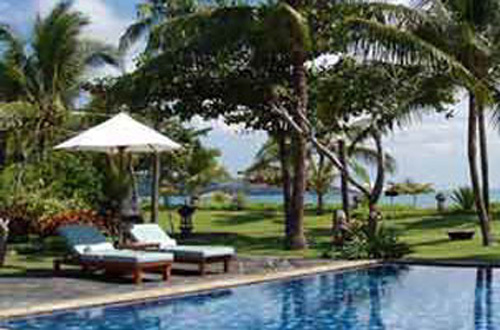 The beachfront villa room with private terrace with beautiful ocean views, while private swimming pool, private villa entrance and all private facilities are all fully equipped this estate. Each Villa Hanani room features the Balinese style pavilion with high quality handmade solid wood furniture, completed with 100% cotton bath towels, face towels, pool towels and hand towels, 100% fine linen bed sheets and Goose down pillows & Duvets. Non-allergenic pillows are also available. More facilities comprises air conditioning with individual temperature control, spacious bathroom and Balinese bath garden, western shower room and Balinese open air shower, indoor Jacuzzi at Master bedroom, hot & cold water, and Handmade natural toiletries and aromatic bath salt, and hairdryer. The in-room entertainments include 21 inch color Television with satellite reception, CD, VCD player and Radio reception, and Stereo set Cassette player. Private stocked bar/refrigerator is also provided in every room, while you can keep on connected to anyone around the globe by utilizing the direct line IDD Telephone, direct line IDD Fax and computer modem at Master bedroom. Bath rob and slippers, in room safe deposit box, and umbrellas are also provided, while the services include daily housekeeping service, laundry & dry cleaning, babysitting service, car rental with driver & taxi, airline reservation & reconfirmation, complimentary airport transfer, express check in/out, guaranteed late check out, complimentary CD/VCD Library, and butler service.